How a woman experiences a later abortion can vary significantly based on her own circumstances, the reasons for her abortion and her beliefs and feelings about the process. Medical providers have their own thoughts and feelings about providing abortion care that also result from their professional experiences personal beliefs. Many women and medical providers choose to share their stories in order to destigmatize the process of obtaining a later abortion. Information about the later abortion procedure and a selection of these stories are below. What happens during a later abortion? This information is a general overview of what a woman can expect when having a later abortion. Most clinics that offer the procedure have detailed information on their websites about the specific protocols at that clinic. Later abortions are done by a process called “Dilation and Evacuation” (D & E) or “Dilation and Extraction” (D & X). 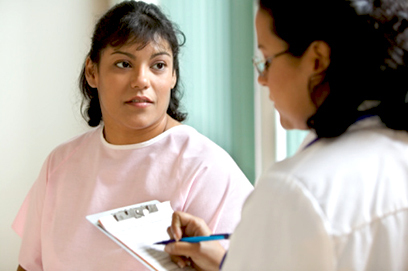 At the first appointment, the woman is given an ultrasound, counseling and a medical examination. Cervical dilation is begun with the use of osmotic dilators. Osmotic dilators that are used most commonly may be either sterile sticks of compressed seaweed (called laminaria) and/or a synthetic get (Dilapan) that upon insertion will gradually swell in size. This process gently opens (dilates) the cervix. The number of osmotic dilators used and the time required for dilatation will depend upon the duration of the pregnancy and the individual woman's body. Usually it takes 24-48 hours for the cervix to sufficiently open. During this time, some clinics offer counseling and/or support groups. For the procedure itself, medicines are used for pain control and sedation. Most commonly, anesthesia medicines are administered intravenously in the arm, and local anesthesia is done by an injection into the cervix. The physician then removes the pregnancy through the cervix with a combination of suction aspiration and grasping instruments. The abortion itself generally takes about 10-30 minutes. In other cases, clinics or hospitals may offer labor induction as the way to end a pregnancy. In most cases, after an ultrasound, counseling and a medical assessment, an injection is used to stop the fetal heart. After that, the woman receives medicines to get her to go into labor and deliver a dead fetus vaginally. This process may take anywhere from less than a day to several days. Sometimes, the labor process is made more rapid by taking mifepristone (the “abortion” pill) and then waiting a couple of days to get the body more ready to go into labor. For labor induction terminations, the woman may be offered any type of pain control that would be used for a vaginal delivery. This may include intravenous or intramuscular pain and anti-anxiety medicines, or epidural anesthesia. Compared to carrying a pregnancy to term and having a delivery, most later abortions present fewer risks of complications. Here's What I Want Donald Trump and Everyone Else to Know About My "Late-Term Abortion"
Dr. George Tiller, who provided later abortions in Kansas for many years until his untimely murder, shares his motivation for providing services to women who need later abortions. The film After Tiller follows four physicians who provide later abortion care and explores their reason for continuing to provide this service. Physicians across the country share their stories of how they became committed to providing abortions for women. Dr. Willie Parker and Physicians for Reproductive Health affirm support for New York's Reproductive Health Act.